Georg Schaeffler, left, and his mother, Maria-Elisabeth Schaeffler, right, jointly own bearings maker Schaeffler. NEW YORK (Bloomberg) -- Ernst & Young was accused by the United States of failing to comply with an Internal Revenue Service request for documents in an investigation of the tax liability of Georg Schaeffler, chairman of the German supplier of the same name. The agency had asked for testimony and "books, records and other data" tied to a tax probe of the Schaeffler chairman, the office of Manhattan U.S. Attorney Preet Bharara said in a lawsuit. The U.S. probe is tied to personal tax liabilities of Georg Schaeffler dating back to 2004, according to a declaration by the IRS agent investigating the matter. 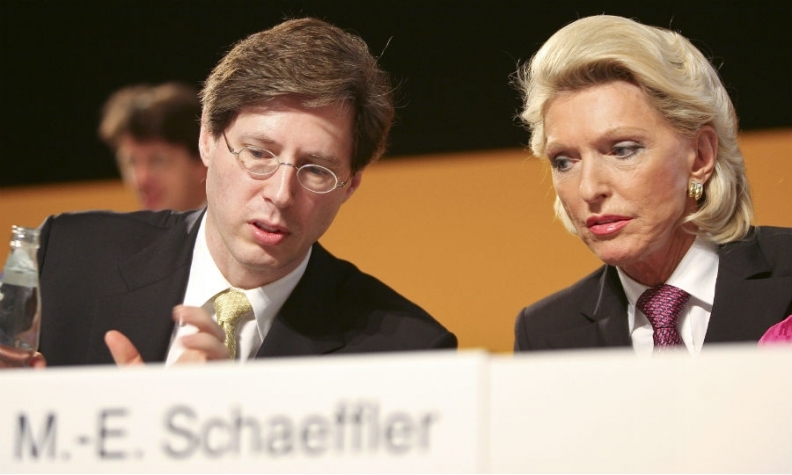 The supplier Schaeffler is jointly owned by Georg Schaeffler and his mother, Maria-Elisabeth Schaeffler. The company is struggling to reduce debt from an attempt spearheaded by former CEO Juergen Geissinger to buy a limited stake in car-component maker Continental that backfired amid the global recession of 2008. Schaeffler, 49, has a net worth of $7.8 billion, according to the Bloomberg Billionaires Index, and he ranks 168th on the index. He owns 80 percent of Schaeffler, which is based in Herzogenaurach, Germany, and is the world's second-largest maker of automotive, aerospace and industrial roller bearings. "I am conducting an investigation into the income tax liabilities of Georg F.W. Schaeffler (the taxpayer) for tax years 2004, 2005, 2009 and 2010," Paul Doerr, the IRS agent, said in the declaration filed in a Manhattan federal court case brought by Schaeffler last year against the IRS. Doerr said he previously conducted an investigation into Schaeffler's tax liabilities for 2007 and 2008 "to determine the taxpayer's correct federal tax liability for those years." The agency previously investigated "the valuation of assets related to the restructuring and refinancing transactions that occurred in 2009 and 2010, after the acquisition of Continental," Doerr said. In his lawsuit, Schaeffler, who lives in Dallas, seeks to halt the government's subpoenas and document requests of Ernst & Young and Dentons, a law firm he hired related to the IRS probe. The IRS has sought privileged documents that it isn't entitled to, Schaeffler has said. John LaPlace, a spokesman for Ernst & Young, didn't have an immediate comment on the government's lawsuit. According to his complaint, Schaeffler hired Ernst & Young after he determined there was a "likelihood of significant U.S. tax consequences and litigation" when his company acquired a far greater-than-expected share of Continental AG during the 2008 global financial crisis. Schaeffler said the documents sought by the IRS were "core opinion work product" created for a possible U.S. audit. The documents requested by the agency also contained tax advice, analysis and legal opinions that are protected by attorney-client privilege, he said. Todd Welty, a lawyer for Schaeffler, called the matter a "routine IRS examination, not an IRS investigation." "My client has been extremely cooperative as part of this civil examination and the IRS seeks documents that we believe are protected by attorney-client privilege and tax-practitioner privilege" Welty said. "They're simply trying to see information that we don't think they're entitled to." In a court filing in Schaeffler's lawsuit, his lawyers said his "circumstances resulted from unfortunate timing." Because the Continental tender offer occurred just days before Lehman Brothers Holdings declared bankruptcy in September 2008, Schaeffler became the owner of 89.9 percent of outstanding Continental shares, according to his complaint. He incurred an 11 billion euro debt which required refinancing and corporate restructuring, he said. As a result, he sought and received tax advice from Ernst & Young and Dentons US after realizing that majority ownership would mean "significant U.S. tax consequences and draw IRS scrutiny," according to his complaint. The U.S. case is U.S. v. Ernst & Young, 14-cv-01242, and the Schaeffler case is Schaeffler v. U.S., 13-cv-04864, U.S. District Court, Southern District of New York (Manhattan).